Hasegawa’s new tool 1/32 scale P-47D Thunderbolt kit, while an excellent rendition of the real aircraft, contains one-piece horizontal tail surfaces when assembled. The real aircraft had control surfaces actuated by cables and, unless control locks were in place, the elevators would react to gravity and droop. Now this detail can be easily and quickly reproduced with our new kit. 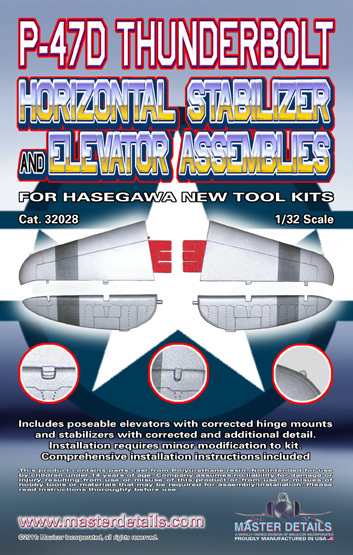 Flawlessly cast in premium polyurethane resin, this kit not only allows the posing of the elevators but also replicates details not found on the Hasegawa kit parts, such as corrected hinges and the small antenna mounting flange commonly found on the leading edge of the stabilizers. Minimum alteration of the kit’s fuselage halves is required for mounting these replacement parts. Complete installation instructions are included. For more information or to purchase your kit please go to www.MasterDetails.com.